Photo-Slate is a dye-sublimation substrate specifically designed to frame and enhance full-colour photographs in a stunning and natural presentation. Each piece is handcrafted with chiselled imperfect edges to make any image a truly unique showcase. Slates can vary in size by up to ½ inch. The natural surface of the slate has natural imperfections that will show through the photos and make each plaque unique. 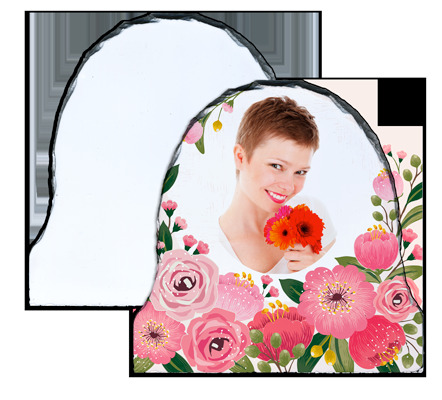 Additionally as with all sublimation printing these substrates are not perfect and some small imperfections on the printed surface do occur. You should inspect each slate prior to pressing for imperfections, and strive to place any imperfections in an area of the image that is least noticeable. However we cannot guarantee that no imperfections will occur, and small imperfections, bumps or pits in the printed surface are not uncommon and not grounds for refund or replacement. They are ideal for cherished images of every kind including full-colour photos, awards, and other valuable keepsakes. Made from natural sedimentary stone, each Photo-Slate comes complete with a stylish black plastic stand and box. Note: We strongly recommend you use a sublimation silicone heat pad when pressing Photo-Slates. Place the silicone pad on the press, place the transfer image side up on the pad, place the slate white side face down on the transfer and close the press.